Western blot analysis of extracts from Jurkat cells, Calyculin A or LY294002-treated, using Phospho-Akt (Ser473) Antibody #9271 (upper), Phospho-Akt (Thr308) Antibody # 9275 (middle) or Akt Antibody # 9272 (lower). Boil for 3 minutes prior to use. 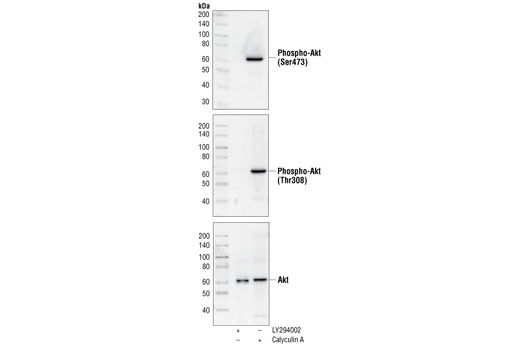 Load 20 µl of phosphorylated and nonphosphorylated Akt extracts per lane. Supplied in SDS Sample Buffer: 62.5 mM Tris-HCl (pH 6.8 at 25°C), 2% w/v SDS, 10% glycerol, 50 mM DTT, 0.01% w/v bromophenol blue or phenol red.Store at –20°C, or at –80°C for long-term storage. Phosphorylated Akt Cell Extracts: Total cell extracts from Jurkat cells, serum starved overnight and then treated with Calyculin A (CST #9902) to preserve their activated Akt state, serve as a positive control. Supplied in SDS Sample Buffer. Nonphosphorylated Akt Cell Extracts: Total cell extracts from Jurkat cells, serum starved overnight and then treated with 50 µM LY294002 (CST #9901) for one hour, serve as a negative control. Supplied in SDS Sample Buffer.